I believe it was January of 2010, perhaps December 2009, when my husband Brian, daughter Esther, and I attended the United States Marine Corps School of Infantry graduation ceremony of my son, Cole. We took, along with us, the grandmother of my husband. Granny, we called her. In fact everyone who knew her called her “Granny”. She was 83, and for the first time in his 44 years, Brian noticed her mannerisms–walking, breathing, and the like–resembled that of her moniker. She was a Rosie the Riveter of WWII, a beauty and a powerhouse of a woman. In her eighties she could out-lift me! I know this because she would often corral me into helping her move a heavy, solid wood, piece of furniture from one end of her house to the other. Bad knee and all–hers that is, not mine! So it was quite shocking to see this grand woman needing ambulation assistance from the car to the bleachers where we sat for the ceremonial debut of Cole, the grunt (the Marine Corps sure goes to lengthy strides in ushering out the pomp and circumstance upon the young grads, only to send them out to the front lines of Afghanistan. But that is another story, not the one I am telling here!). Yet to the bleachers we went, though Granny took a trip over the legs of another person who happened to stretch his out just as she was passing by his seat. Between Brian and myself we caught her, but the increased pressure the near fall caused her, already sore knee, was apparent. With her discomfort in mind, I sat close to her so as to keep a watchful eye upon the, now fragile, woman. I confess, I was a bit irritated at her insistence upon joining us, especially as her fragility was now an issue. In my selfishness, I wanted to only focus on my son without having distractions. But I did get over myself and took on the perspective of gratitude that this woman, in all her discomfort, wanted to support the accomplishment of her great-grandson. Cole and his Granny were a special pair, and her being there was absolutely as it should be. As the ceremony began, as it continued, and as it ended many tunes were played. I had the privilege, because I was next to the woman, to witness Granny stand up as if on a twenty year old knee and sing every word of each patriotic song, then sit down again as if the call to action was no imposition to her worn out legs. Not only did she sing, she sang with tears in her eyes and her hand over her heart. She sang without shame, and a glimmer of something precious was in her eye. A glimmer I did not possess. In that moment, I envied the sense of patriotism Granny exuded. I still do. And I have never forgotten it as it is my impetus to better understand the motivating gratitude from which it was generated. Now on Monday of this past week, Memorial Day, Cole requested we go to the Marine Corps Park in San Clemente to pay tribute to his fallen brothers. So that morning, I took him to purchase the flowers he wanted (the type had been discussed in detail previous to the day so I knew what we were after). And Brian, Esther, Cole, and I hopped into our 1956 Ford and headed south to the park (not to be confused with the show, ‘southpark’). To get there we had to go around a Memorial Day blockade and be subject to the rude interaction from one of the traffic volunteers. We then found the one handicap space available which put Cole’s side of the car directly into the bushes making it difficult for him to navigate his balance, his cane, the car door, the incline, and the shrub all at once (not to worry, we watched–just kidding, helped). We then made it across the lot to the park. Cole stood quietly with his cane, his dad by his side. 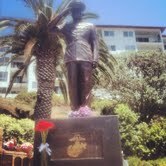 We placed the flowers at the foot of the Marine statue and then Brian asked Cole if he would like for him to read the devotion of the day from his devotional book. The answer was, “yes”. We then read every plaque and name imprinted on the statue and the surrounding wall. I sat down on a bench with Esther as Brian offered to read the inscriptions to his son–the ones Cole’s poor eyesight kept him from reading for himself. All the while, I couldn’t help feeling choked up. In fact, I had to wipe away many a gratitude-filled tear. And I remembered Granny, her beaming face, her gaze at the USA flag, and her knowledge of every word to every song sung at Cole’s SOI graduation. I could feel the appreciation for the willingness of a stranger to give of his/her life for the benefit of others–the awe that my son is among them. And I could feel the sorrow of the loss of each family who had a name on a plaque, while understanding more passionately the miracle of having Cole still with us. Brian tore the page from his devotional and left it under the flowers; right next to a handwritten note from a Vietnam Vet paying tribute as well. It was difficult, in our silence and humility, to know when to leave…though Cole helped with that as his stomach was calling the shots. I am learning, and presently my son is the one teaching. ABSOLUTELY BEAUTIFUL!!! This one deserves to be in a Marine Corps publication! Rivka, I was so proud that I got to go to Coles’ graduation from boot camp. It was there that I got a real sense of patriotism. Seeing all those men and women who fight for our rights and putting their lives on the line for my freedom was amazing to me. I thank everyone who has ever served and the people who are getting ready to serve and my heart goes out to the families of the ones who lost their life while serving our country. Yesterday our brother went to our dads grave and he sent a photo to Greg which Greg posted on facebook. It was a photo of dads headstone with an American flag in front of it. Aaron said it was not hard to find dads grave because it was the only one in the cemetery with a flag. Of course I am sure there are many men and women who are buried there that served in the military but I guess dad is the only one with a military headstone. When I saw the photo yes I felt sad for the reminder that dad is no longer with us but very proud too when I saw US Army on his headstone and the flag in front of it. I guess I will wrap this up by saying thank you to all the military people and their families. How glad I am to know our father’s service is recognized on his headstone, and the flag is touching. I would like to see the photo…guess I had better call our bro-hair. Thanks for sharing this story. Thank you, Greg. The tribute is perfect!